Registration for Fall classes for the LEAP program are now open! TBBC is partnering with the New Jersey Commission for the Blind and Visually Impaired (CBVI) on the LEAP initiative. 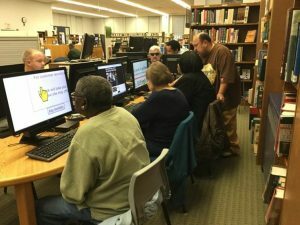 The Library Equal Access Program (LEAP) provides free computer and iPad training classes at assistive technology learning centers located in eight public libraries across the state. LEAP is for New Jersey residents 55 and older who have a change in vision. In this beginner class, you will receive an introduction to the iPad. In addition, you will be introduced to accessibility features on the iPad, such as Zoom and Voice Over (Apple’s built-in screen reader), to access the iPad. iPads will be available for use in class or you may bring your own iPad or iPhone with you (the accessibility features on the iPad and the iPhone are the same). iPad experience is a prerequisite for this course. In this intermediate class you will build on your basic iPad skills to learn more about the accessibility features and assistive apps available to you. iPads will be available for use in class or you may bring your own iPad or iPhone. This beginner class covers basic computer terminology, mouse & keyboarding skills, and computer navigation skills. 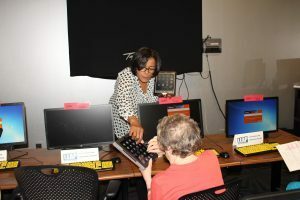 You will also receive an introduction to the software available on these computers to help you see and hear the computer. To register and find the schedule for these FREE fall classes, please call the Talking Book & Braille Center at 800-792-8322, extension 802.